Citation: C N Trueman "Martin Luther King"
Martin Luther King is probably the most famous person associated with the civil rights movement. 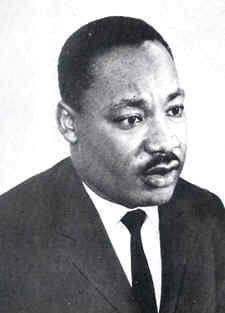 King was active from the start of the Montgomery Bus Boycott of 1955 to 1956 until his murder in April 1968. To many Martin Luther King epitomised what the civil rights campaign was all about and he brought massive international cover to the movement. Martin Luther King was born in Atlanta, Georgia on January 15th, 1929. The church was very much a part of his life as both his father and grandfather had been Baptist preachers. They themselves were involved in thecivil rights movement. By the standards of the time, King came from a reasonably comfortable background and after graduating from college in 1948 he was not sure about which profession to join. He considered a career in medicine and law but rejected both and joined the Baptist Church. He studied at the Crozer Theological Seminary in Pennsylvania. It was while studying here, that King learned about the non-violent methods used by Mahatma Gandhi against the British in India. King became convinced that such methods would be of great value to the civil rights movement. After leaving Crozer, King got married to Coretta Scott. He became a Baptist pastor at the Dexter Avenue Baptist Church in Montgomery, Alabama. He was in Montgomery at the start of the Montgomery Bus Boycott. He was appointed the president of the Montgomery Improvement Association which was created during the boycott and he became a prominent leader of the boycott – even driving some of the black community to work as the buses had been boycotted. King was arrested for starting a boycott (an arrestable offence as a result of an obscure law that was very rarely used) and fined $500 with $500 costs. His house was fire-bombed and others involved with MIA were also intimidated – but by the end of 1956, segregation had been lifted in Montgomery and bus integration had been introduced. Another result of the boycott was the establishment of the Southern Christian Leadership Conference (SCLC). This organisation was committed to the use of non-violence and its motto was “Not one hair of one head of one person should be harmed.” Martin Luther King was elected its president. The importance of the SCLC’s involvement was simply because the churches that represented the black population in the South were potent organisations. Now that they had combined their power and influence, this power was multiplied. Not long after the conclusion of the Montgomery Bus Boycott, King wrote ‘Stride Towards Freedom’. This was read by some students at Greensboro, North Carolina and they started the student sit-in of the Woolworth’s lunch counter which had a policy of not serving African-Americans. Though the students were frequently abused and assaulted, they never fought back. The same tactic – a non-violent response to violence – was also used by the Freedom Riders in their campaign to desegregate transport. Buoyed by this response, King toured the country making speeches and urging more and more people to get involved in the civil rights movement. King had also noted the economic power that the black community had – as was seen in Montgomery. He tried to get communities to use companies/individual shop keepers etc. who were sympathetic to the civil rights campaign but also to boycott those who were not. King also placed great faith in the power of the vote. Many black Americans in the South still faced enormous problems doing something as basic as registering to vote such was the intimidation they faced. In Mississippi, 42% of the state’s population was black but only 2% registered to vote in the 1960 election. However, more and more did register throughout the South and in 1960, their support (70%) helped to give the Democrat J F Kennedy the narrowest of victories over Richard Nixon. In 1963, Kennedy proposed his civil rights bill. To persuade Congress to support this bill, King, with other civil rights leaders, organised the legendary March on Washington. Baynard Rustin was given overall control of the march. The march – officially the March on Washington for Jobs and Freedom – was a major success. Held on August 28th, 1963, it attracted between 250,000 and 400,000 people. The final speaker was Martin Luther King and it was here that he made his legendary ‘I have a Dream’ speech which was heard throughout the world and did a huge amount to publicise the civil rights movement in America across the world. Congress did accept Kennedy’s civil rights bill and it became the 1964 Civil Rights Act – a far reaching act that many saw as a fitting tribute to the assassinated Kennedy. King then moved on to a bill that would guarantee the voting rights of the black community in America. This led to the 1965 Voting Rights Act. From this time on, King became more and more concerned with the poverty of those in America – both black and white. For whatever reason, King became more radical – or so it seemed to those who distrusted him. He used the word “revolution” in some of his speeches and he voiced his opposition to the Vietnam War. King also became involved in trade union issues. King had clearly made enemies in his rise to fame. At the most basic level, the KKK did what they could to tarnish his name in the South. However, it was the work done by the FBI under the leadership of J Edgar Hoover that did most damage. Rooms where King stayed during his travels were bugged and recordings of his alleged sexual improprieties were made. The FBI released such details to the press. On April 4th, 1968, Martin Luther King was shot dead by an assassin. His death sparked off riots in many cities and 46 people were killed during these. In March 1969, James Earl Ray was found guilty of King’s murder and sentenced to 99 years in prison. Many years after starting his sentence, Ray claimed that he was innocent and that he could not have killed King.